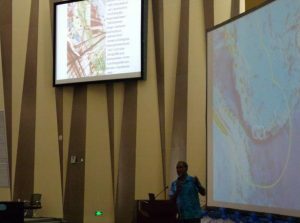 The first ever Vanuatu National Oceans Summit was held at the Convention Centre in Port Vila on 21.4.2017. 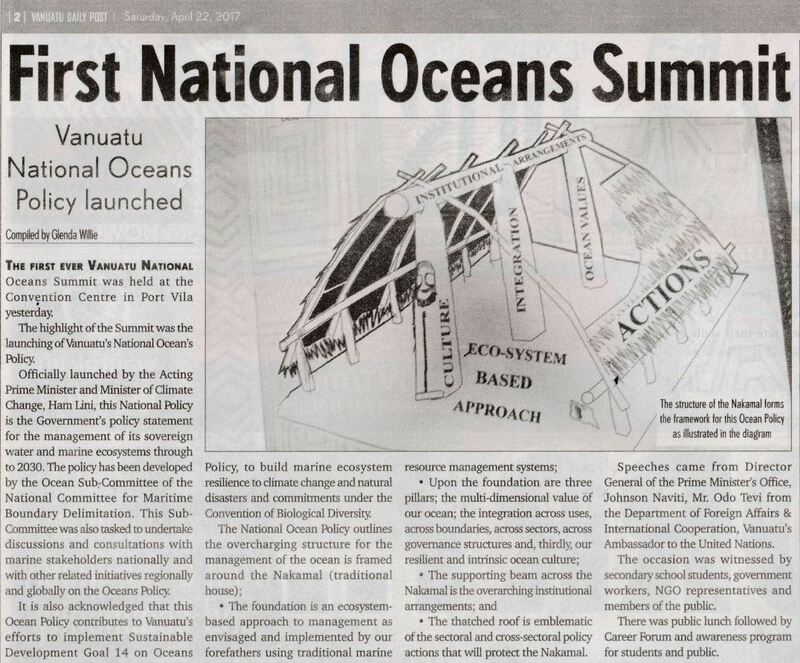 The highlight of the Summit was the launching of Vanuatu’s National Ocean’s Policy. Ofﬁcially launched by the Acting Prime Minister and Minister of Climate Change, Ham Lini, this National Policy is the Government’s policy statement for the management of its sovereign water and marine ecosystems through to 2030. The policy has been developed by the Ocean Sub-Committee of the National Committee for Maritime Boundary Delimitation. This Sub-Committee was also tasked to undertake discussions and consultations with marine stakeholders nationally and with other related initiatives regionally and globally on the Oceans Policy. The thatched roof is emblematic of the sectoral and cross-sectoral policy actions that will protect the Nakamal. 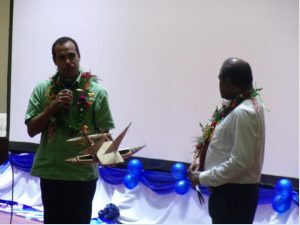 Speeches came from Director General of the Prime Minister’s Office, Johnson Naviti, Mr. Odo Tevi from the Department of Foreign Affairs & International Cooperation, Vanuatu’s Ambassador to the United Nations. The occasion was witnessed by secondary school students, government workers, NGO representatives and members of the public. There was public lunch followed by Career Forum and awareness program for students and public.